One of my favorite topics of conversation at watch events, such as the RedBar Crew meetup, is the concept of grail watches. For those of you not familiar, many people in our community use the term “grail watch” to describe a watch that’s at the top of their wish list. What you may not know is that nearly every collector you’ll meet changes his/her grail watch regularly. Sure, some of us end up acquiring that grail piece, but as horophiles, many of us find something else that catches our eye. 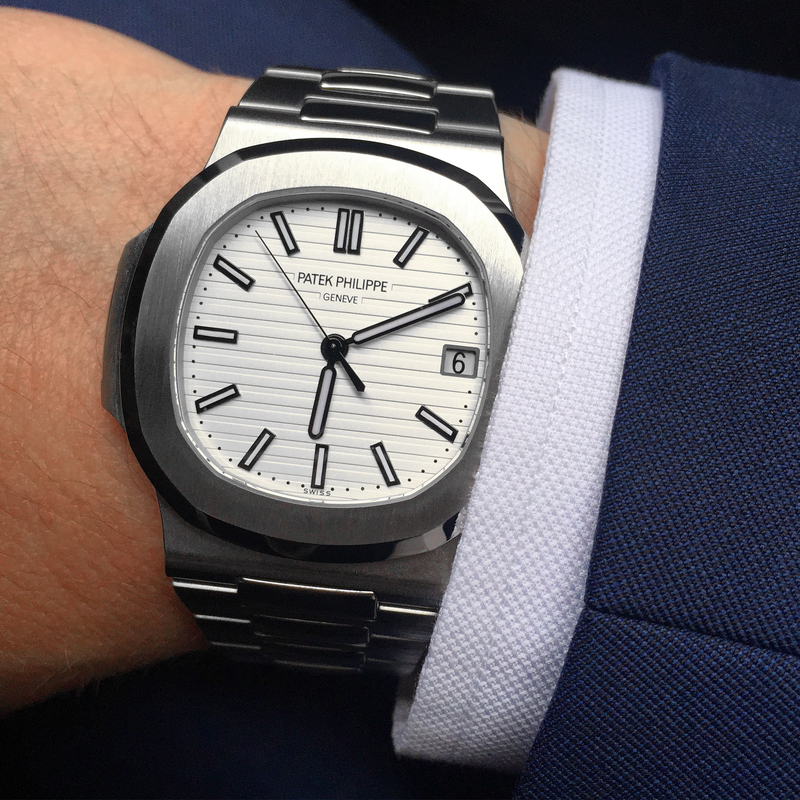 For me, the Patek Philippe Nautilus (Ref. 5711-1A-011) — a piece that I’ve owned for almost a year and a watch on top of many collectors’ wish lists — is my grail. My obsession with this piece started long before I had a moderately successful Instagram page about watches. Flashback to 2011, when I was frequently traveling internationally, and one of my primary destinations was Geneva, Switzerland. As you can see in the photo above, if you’ve ever had a chance to visit Geneva, you’ll notice something very horologically interesting; nearly every building on Lake Geneva is adorned with a sign or logo for a major watch brand. While in Geneva, I would encounter and be inspired by the various brand billboards on top of nearly every building on the lake. If you’re a curious sort, you have no choice but to go back to your hotel room and start Googling. While I may not have been as into luxury watches at the time, I guess you could say the writing was on the wall. 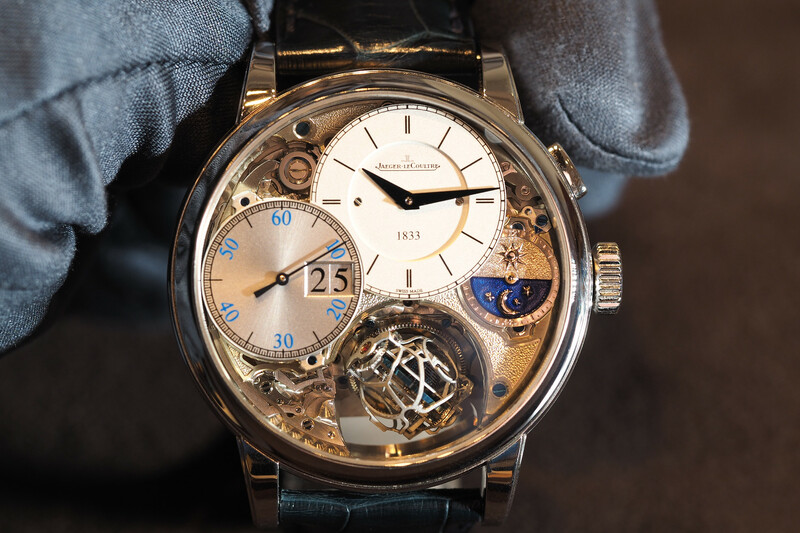 My time in Geneva helped foster a curiosity and appreciation of haute horology. While many of the brands (Patek included) don’t base the bulk of their manufacturing in central Geneva, many still maintain some kind of presence in Geneva proper. Patek Philippe bases their manufacturing in the canton of Geneva, which is right outside the city center. Perfectly understandable, as their production output has multiplied many times over since their founding in 1851. In terms of name recognition in the watch industry Rolex comes first, and Patek Philippe second. As you may have previously read, my first nice timepiece was a modern Rolex Explorer I 39 mm (reference 214270). Shortly after purchasing the Explorer, my interest in Rolex skyrocketed. I purchased a Milgauss, Daytona, GMT II (Coke), GMT Root Beer, Oysterquartz, and the list goes on. Once I started attending RedBar, I quickly realized the world of horology wasn’t a bunch of pretentious rich dudes with nice watches. 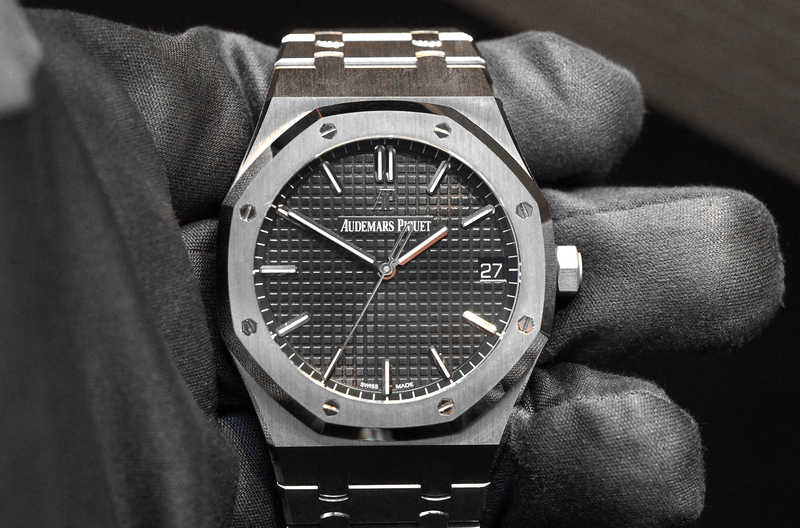 I started getting some hands-on time with pieces from Audemars Piguet, Blancpain, and Patek Philippe. Getting weekly time with watches from the major players changed my perception of what watch collecting should be. My fellow RedBar members also gently nudged me to diversify my collection outside of Rolex. Reminiscing about this time, my mind’s eye sees a montage of the Lake Geneva shoreline (see Deep Purple: Smoke on the Water, which is actually about drinking and partying on the Lake Geneva shoreline—who knew?) and scenes of myself with a bunch of collectors gathering over drinks and horological conversation. I first got my hands on a 5711 when Spanish Rob (yes, that’s his name) came to Red Bar with his “Loved Patek.” “Spanish,” as he prefers to be called, formerly worked at Tourneau and the Patek Philippe salon at Tiffanys. While his 5711 is certainly well loved and has the patina to prove it, the beauty of the design gave me a whole new appreciation for Patek. The 5711 Nautilus was devised as a high-end stainless steel sports watch. It is water-resistant (to 120 meters), has a sapphire crystal front and back, and is very durable. The origins of the piece go back to Gerald Genta‘s original design in 1976. After nearly a year on the wrist (between the fiancée and I), I’ve found the piece incredibly versatile. Dressed up or down the watch goes perfectly with nearly any clothing combination. There’s a reason these watches are so attractive to a broad variety of collectors. I was most surprised how “under the radar” this watch can be. I can’t remember the last time a non-horophile commented on the Nautilus. Overall, it is an awesome watch with a great heritage, and a piece that can wear well on nearly any occasion. Well built, modular construction, well balanced, and impeccably finished. I found the case hard enough for normal wear under the cuff, and the occasional swim. If you look closely, you’ll see the subtle seals and screws that go unnoticed to the untrained eye. Probably my favorite part of this watch. A very intriguing white, gray, and silver daydream of a dial. 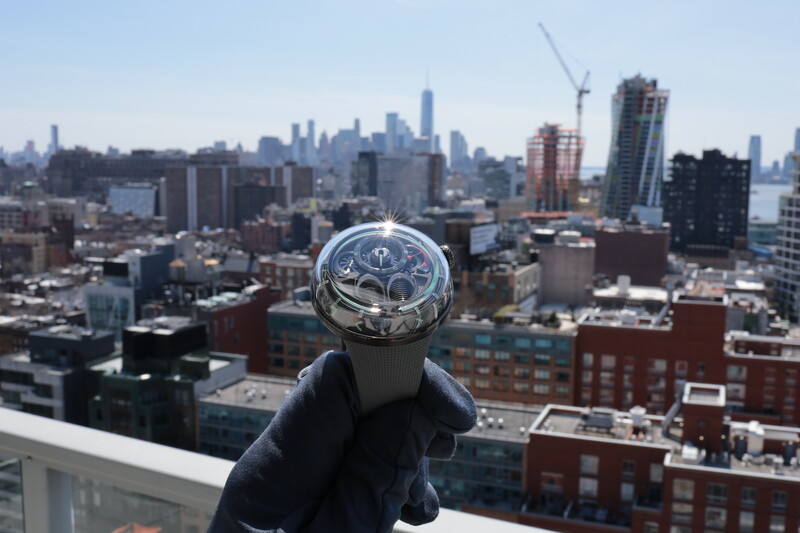 Looking directly into the dial you see white; move it to the side and you see a very subtle gray color, and tilt the watch sideways and you’ll notice a nimbus-cloud silver color. On top of all that, the dial has given me the most entertainment on social media: a commenter on my Instagram page noted the dial looks “like a garage door.” I’ve kept the garage door dial moniker and it’s been a popular joke in the community. Polished center link, amazing brushed links, and a clasp that is simple to use. It would be nice if Patek Philippe would offer a leather strap option (I’m talking to you, aftermarket strap guys!). On my piece, the links are held together with push pins instead of the more modern screw pins. The caliber 324 is a powerhouse movement. Seen through the sapphire crystal case back, you can see the 22K rotor and the beautifully finished main plate and bridges. The movement is super thin. One notable oddity is the rotor is seated on ceramic ball bearings, which you can sometimes hear operating in concert with the rotor to make a pleasant whirling noise. The piece sits nicely on the wrist, isn’t incredibly flashy, and ticks all of the wearability boxes. As for durability, the steel Patek used in this watch is hardened and has been a dream to wear. It’s great as an everyday-wear watch, and after a quick soap and water cleaning it looks like new. I consider this piece to be one of the hallmarks of my collection. I’m a fairly active collector so I’m constantly moving pieces in and out. However, it would take quite a bit to make me part with the 5711. The watch has proven its versatility and has become both a staple and a star of my collection. If you buy one, you won’t be disappointed.